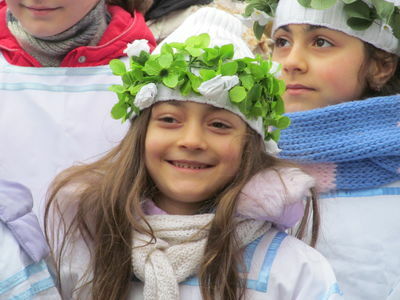 Holy Saturday in Pievėnai (Mažeikiai district municipality, Lithuania). 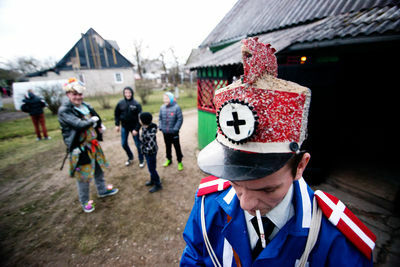 Every Easter, in the small Lithuanian village of Pievenai, a group of young men in uniform guard the local church to ensure their yearly procession goes undisturbed. 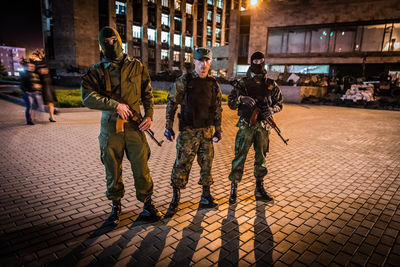 However, they are not guarding against street gangs or violent criminals, they are guardian against what they call the “Easter Jews”; a group of young local men wearing masks and clothes resembling visual stereotypes of orthodox Jews. 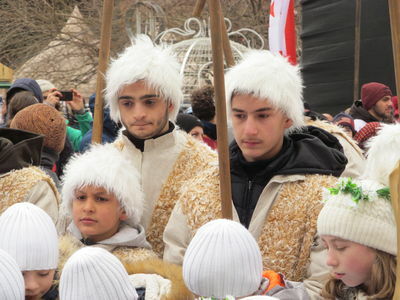 Both groups of young men are part of a dying Lithuanian Easter ritual in which the people in uniform prevent the so-called “Easter Jews” from breaking into the church, stealing the crucifix, distracting worshipers from god, and disturbing the resurrection of Christ. 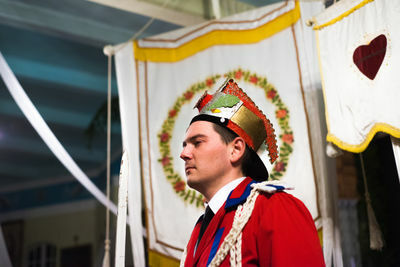 On the eve of Easter, the guards begin their night watch, as the young men dressed up as “Easter Jews” begin trying to infiltrate the church and disrupt the evening mass. The guard’s night watch continues through the night until the last worshipers have left the church. 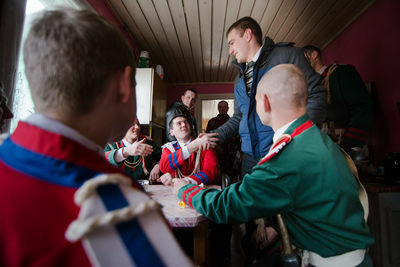 The guards then go to rest in a nearby house where they play cards and drink beer. 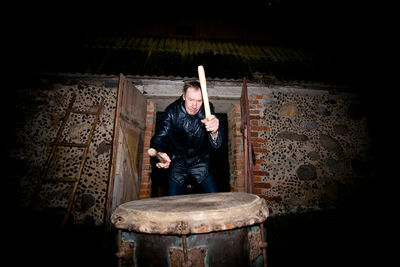 The next morning, at the crack of dawn, a beating drum awakens the villagers and summons them to the morning mass. 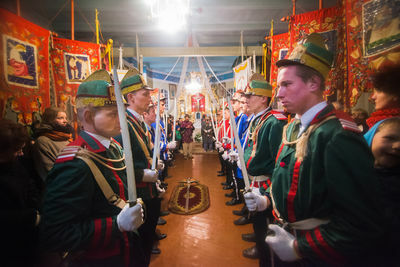 The guards return to the church, along with the “Easter Jews”. After the service is held, worshipers and guards begin a procession in which they walk around the church three times. 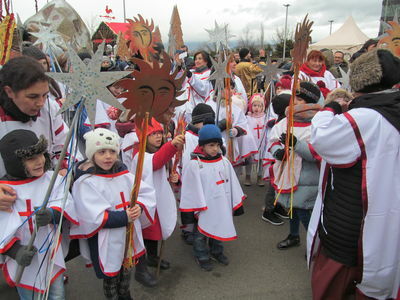 As this is happening, the “Easter-Jews” run around the church in the opposite direction a total of nine times, with the intention of disrupting the procession and the resurrection of Christ. There are four teams that dress up as soldiers and they all wear different colored uniforms. 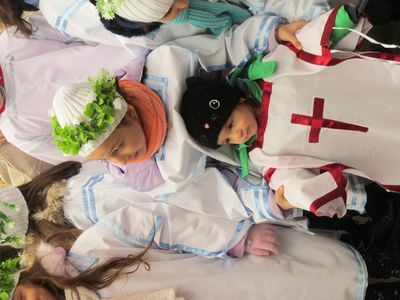 The red uniforms represent the blood of Christ, the green ones symbolize regeneration and hope, the blue ones symbolize the ascension of Jesus, and the white ones represent the sheet in which the body of the Christ was wrapped. 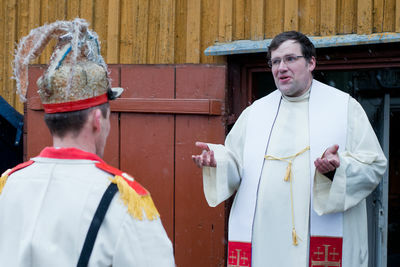 According to the local priest Saulius Styra the origin of the tradition is not known: "It is said that virtually all the churches had such soldiers before the [Second World] War." 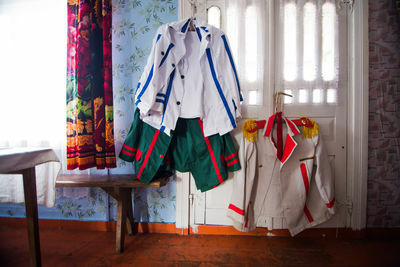 However, locals say that the Pievenai is the only village that still practices the tradition. 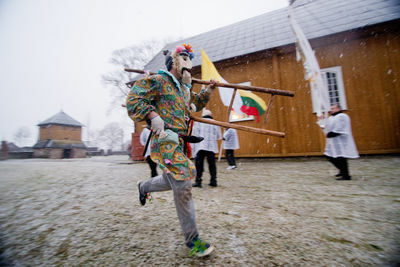 Most Lithuanians today are unaware of this outdated tradition. For many of those who are aware of it, they regard it as a relic of the past and an outdated remnant of old-world fascist mentalities. For them it is out of step with modern times. However, those participating do not see it that way. 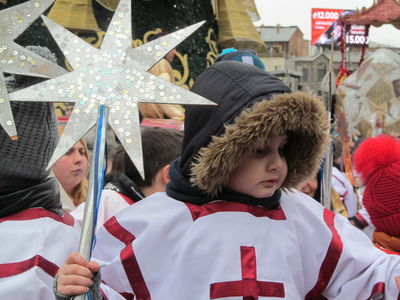 For them it is simply a local tradition derived from the bible that is not meant to offend or demonize anyone. “Easter-Jews are tempting believers,” explains Priest Styra, “they are equated to devils. And this scenario is taken out of Jesus’ Crucifixion [from the Bible]. In the region where Jesus was crucified, everyone was Jewish, and I do not see any humiliation of Jewish people in this play”. A soldier after finishing night watch. On Easter morning the commissionaire reports to the priest that the cross was kept safe. 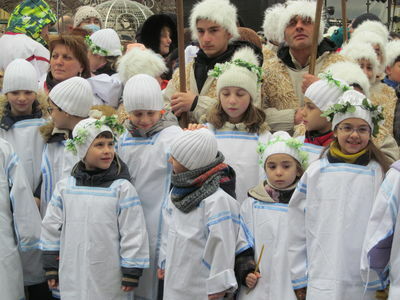 To show their hostility, the "Easter-Jews" frolick and run around the church in the opposite direction of the procession. 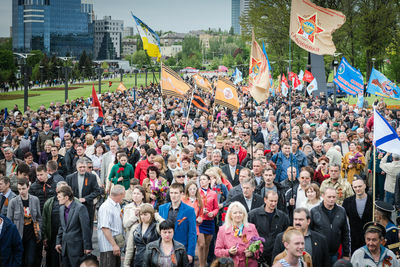 The procession walks three times around the church while the "Easter-Jews" run around it reverse nine times. 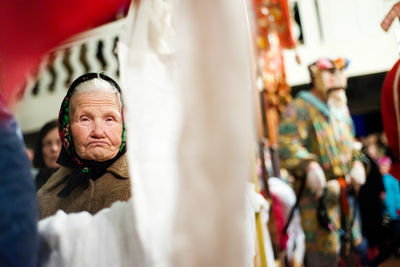 An elderly woman at the Easter Mass gathering in Pievanai. 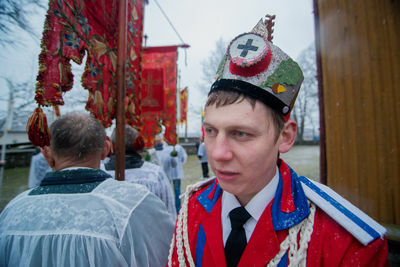 While the "Easter-Jews" ritual was commonplace in Lithuania before World War Two, it is now only held in the village of Pievanai. Most of Lithaunia's once thriving Jewish population was exterminated during the Holocaust. Villagers are summoned to morning Requiem Mass by a beating drum at the break of daw. It is thought that the sound of the drum is the sound of joy. The sound also said to deter evil spirits who try to hinder the resurrection. When there is no one left in the church, all the teams come back to the house: to sleep, to have a snack, or just relax. In the morning  before believers start to gather, they are go on watch again. The blue team enjoys a late dinner. 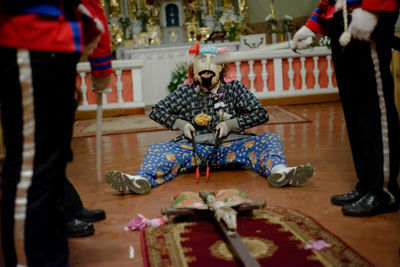 An "Easter-Jew" sews mayhem in the church and tries to steal the cross. "I think that the festival is a beautiful custom of the village," explains Jonas, the man behind the mask. "My grandfather, my father, and my brother all took part in it and that is why I am participating too. 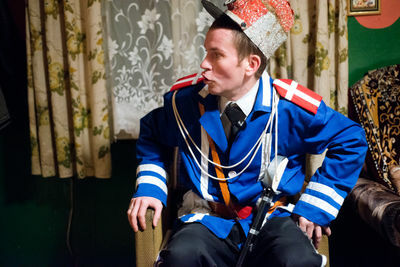 For four years I had acted as a soldier only this year I tried the role of a Jew. It is a pleasure to play the soldier’s role, but I enjoyed being a Jew much more." 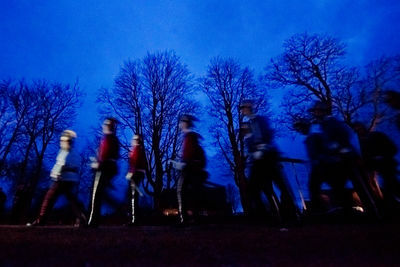 Soldiers marching to the church. A red team soldier keeping night watch. 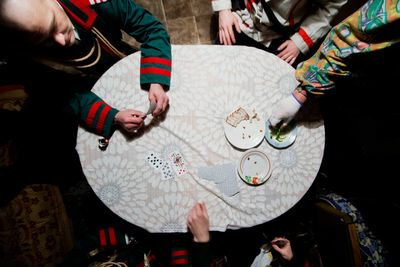 The commissionaire, soldiers and "Easter-Jews" play cards together as they feast. 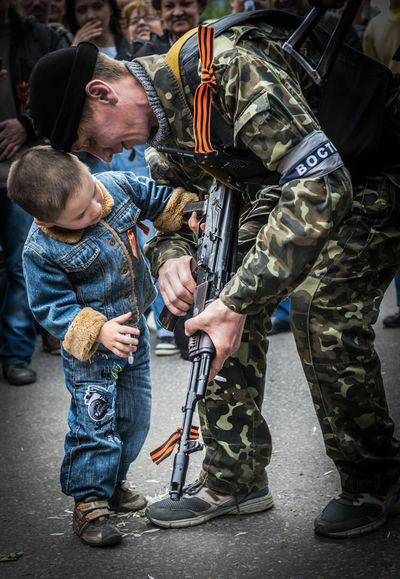 A soldier reacting quickly after hearing the color name of his team. 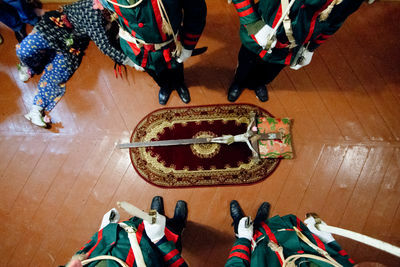 Soldiers keep watch over the cross, which is the centerpiece of the entire ritual. It is the goal of the soldiers to protect the cross from the "Easter Jews" who are trying to steal it. 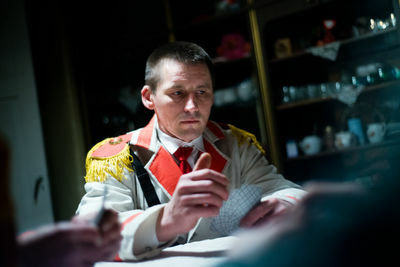 The commissionaire, the leader of the soldiers, plays cards with team members. 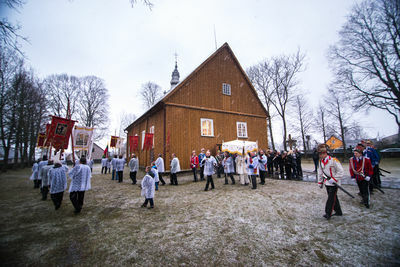 All teams gather in the church at the start of the ritual to salute the cross. The last smoke before the start of the ceremony. 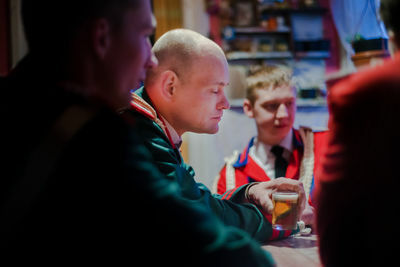 Before and during the night watch, soldiers are take turns drinking beer from the same glass. Before night watch youth gather in the house. 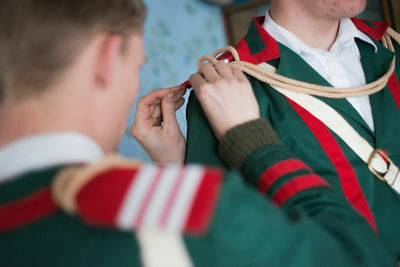 A member of the green team assists his teammate in getting dressed. 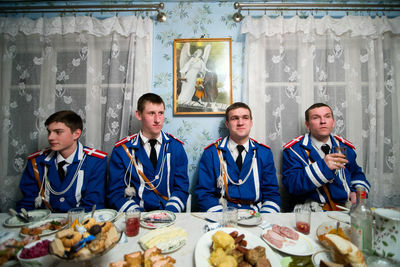 In the house closest to the church, the coats of the soldiers are hanged before the feast. The white team (the coat hanging above) did not participate this year. 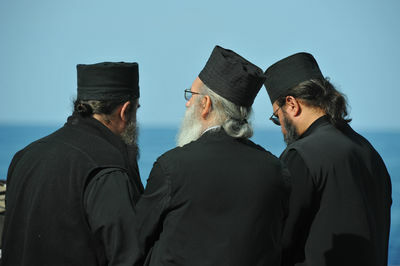 Greece, Chalkidiki, Mount Athos, Safni, 10.10.2014, Orthodox monks on pilgrimage at the holy Mount Athos. Despite the civil war currently devastating Ukraine this year, an estimated thirty-thousand Hasidic Jews gathered in Uman, a small city at banks of the Umanka River, paying little attention to the worldly, bloody political struggle surrounding the site of their spiritual leader's tomb. Since 1811, Jewish followers of the Breslov Hasidic movement make an annual pilgrimage to visit the grave of their founder, Rabbi Nachman (1772-1810) of Uman, in central Ukraine. The gathering, permeated by the rhythm of prayer and teaching, joy and remembrance is a central part of this religious group's devotional practice. 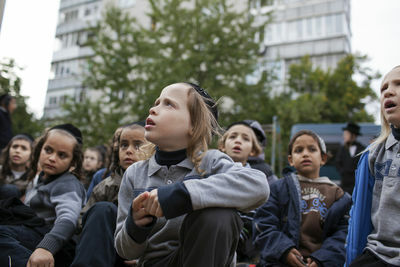 In the 18th and 19th centuries, the city of Uman had a large Jewish population. In 1941, when the Germans invaded Ukraine, some seventeen-thousand Jews were murdered and the rest were deported - tragically wiping out the entire Jewish community of Uman. Despite the Nazi occupation and Communist regimes, Jews continued to make the pilgrimage to Rabbi Nachman's grave even though in some years less than a dozen completed the journey. Since the fall of Communism, a small but growing Jewish population has re-established itself in Uman in close proximity to the grave of Rabbi Nachman. Despite Uman's remote location, people travel from all over the world for just one week out of the year. 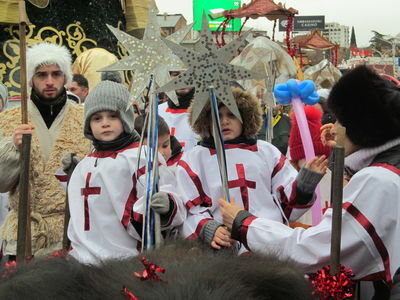 Uman is typical of a small Eastern European city. However, Rabbi Nachman’s grave is protected inside a collection of buildings and sanctuaries situated in something more reminiscent of an old Jewish Ghetto. Crooked streets and congested buildings rest haphazardly on top of each other and harken back to a place frozen in time. Instead of Cyrillic, signs are in Hebrew. 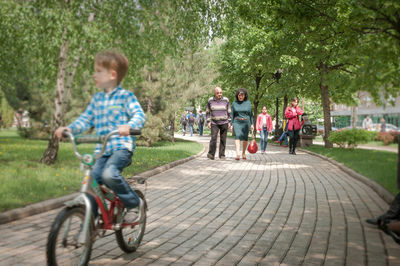 Instead of people dressed in shirts and slacks, the streets are filled with men and women, often separated by gender, and dressed much like those who lived in Uman In the 18th century. Today, the pilgrimage is undertaken by individuals driven by faith and obligation. 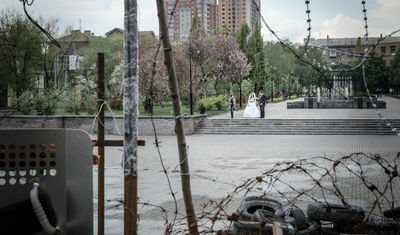 A sea of white shirts or black suits and hats, large groups of men and, separately, large groups of women, focus on prayer - blind to the chaos and bloodshed that grips Ukraine. In the small village of Taybeh (population: 1,500)—the last remaining fully Christian village in the West Bank—is Palestine’s first and only microbrewery. The brewery’s story began with the promise of peace and the Oslo Accords, when Nadim Khoury and his family returned to Taybeh in 1995 after 30 years in Boston. Nearly 20 years later, the obstacles to running a successful business in Palestine have not ceased. Last year, the brewery's annual Oktoberfest was canceled and forced to relocate to a smaller location outside of a Ramallah hotel, and precarious border regulations and regional instability continue to be an obstacle. Yet, the Khoury family has created a distinctly Palestinian microbrew that they sell in the West Bank and export to Israel, Japan and Sweden. This is the story of one small town and how its microbrewery is putting a different face on resistance. -Shots of signs entering the West Bank, the separation wall. -Madees Khoury, Assistant Brewer and daughter of Nadim Khoury: “Doing business in Palestine is not easy. Also being a beer company in Palestine, doing business is not easy. And then being a beer company, doing business in Palestine under occupation is even worse. -Madees Khoury: “Palestinians want to live a normal life like anywhere else in the world, like just go to school, make money, drink beer, go to parties, you know, have fun live life, love life." -David Khoury: “I hope to continue growing, God gives us health, I’m wishing that my children will come back and continue the legacy of the Taybeh beer in Palestine. Kiev train station, dead civilian. 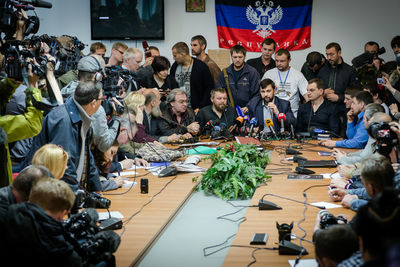 Denis Pushilin, Press conference, Donetsk.